Wild Sally Road: Beads Glorious Beads! Oh, I am the luckiest beader ever. We spent the past week in Anaheim and Los Angeles with our daughters, granddaughters and SIL. It was a great week (and I'm still totally exhausted). Here is the soon-to-be 5 year old modelling the bracelet I made for her and the necklace we made together (got to get them started young). And here's the 2 year old as a pirate for Halloween with her BFF, the ladybug. These girls are amazing and beautiful and funny and charming and smart as can be! So much fun!! They alone would make me the luckiest person ever but something really wonderful happened while we were there. My daughter gave me her bead stash!!! YES! She was a beader in high school and on into early adulthood but later years have been too busy (and child-filled and cat-filled) to leave her any time to bead. Or maybe she just got tired of it. I'm not sure which but I'm so excited to show you my new stash additions. I made some suggestions about taping the individual boxes of beads but was assured they were packed in tightly and off they went into the mail. They arrived yesterday with beads all over the place. Lots of them landed on the kitchen floor. 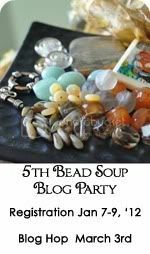 Bead soup, thy name is MESS!! But I will have a good time sorting through this mountain of beads -- 15 boxes and one plastic bag FULL of stuff!! This is like Christmas only better!!! Here's a look at what's completely disorganized inside these boxes. I'm very grateful to Brooke for all this goodness. Someday she may want to bead again and I'll repay her in kind! Oh girl, you hit the jackpot of beads!!! so glad you got to go spend some time with family. That's the best part! Looking forward to lots of new beady goodness coming from you! Lucky lady! ...and your grandkids are really cute too! yikes to the open boxes and mess! but i'm glad that you're enjoying the beads! we MISS YOU so much! The children are adorable! I think you're going to be verrrrrrrry busy for a while.